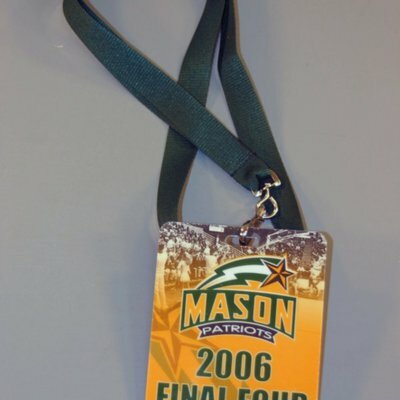 Two-sided Mason Patriots NCAA Final Four badge with green lanyard. Badge is green and yellow in color, two -sided, and measures 3" x 4". Lanyard is green in color and measures 17.5". Printed pamphlet by the Office of Information Services containing factual information about various aspects of George Mason University, 1973. 4" x 11". Two colors. 16 pages.